Volkswagen followed by Mercedes and BMW were the top-selling passenger vehicle marques in Germany in 2010. The VW Golf remains Germany’s favorite car model. Volkswagen easily remained the top-selling passenger vehicle manufacturer in Germany in 2010. Premium auto brands Mercedes and BMW were the second and third most-sold car brands in Germany, while Opel just managed to beat Audi to fourth place. The VW Golf easily remained Germany’s favorite car model by far. In 2010, a total of 2,916,260 passenger cars were sold in Germany according to automobile sales statistics released by the Kraftfahrt-Bundesamt. This was a decline of 23.4% from the 2009 German car market. The German car market in 2010 was always expected to be difficult. German car sales in 2009 were relatively good due to government incentives (Abwrackprämien) to replace older, polluting cars. The end of the scheme hit manufacturers of small cars particularly hard in 2010. Total motorized vehicles sales in Germany in 2010 were 3,374,227 units, a decline of 20.4% from 2010. Heavy vehicles saw significant increases in sales of around 15%, while buses were down a further 7% and motorcycles were down 10.4%. There was no change in the components on the list of the top twenty best-selling car makes in Germany in 2010. In the list of top ten best-selling car brands in Germany in 2010, Peugeot entered at ninth place at the expense of small-car manufacturer Fiat – a reverse of what happened in 2009. However, there were significant changes in the order of the best-selling car manufacturers in Germany in 2010. 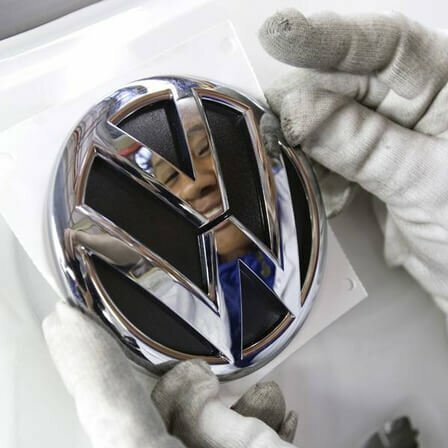 Volkswagen easily remained the top-selling car brand in Germany and maintained its 21% market share despite a drop of almost 24% in the number of VW cars sold. Premium car manufacturer brands Mercedes, BMW, and Audi, which gained little benefit from the car scrapping scheme in 2009, all managed to increase market share in 2010. BMW (+3.4%) was the only car manufacturer with more than 1% market share in Germany in 2010 to actually increase the number of cars sold as well. Mercedes moved from fourth place in 2009 to second in 2010, while BMW moved up from fifth to third. Opel slipped from second to fourth and Ford from third in 2009 to only sixth place in 2010. Manufacturers of mainly small cars performed the worse in Germany in 2010: Fiat was down 52.3% and Suzuki down 45%. Opel, Ford, Renault, Skoda, Peugeot, Citroen, Kia, and Honda all saw sales slipping by over 30%. Despite a miserable year, Toyota (-43.2%) remained the top-selling Japanese car manufacturer in Germany. Toyota just managed to remain the tenth best-selling car brand in Germany, ahead of Hyundai, the best-selling Korean car manufacturer in Germany in 2010. Although unit sales were down by around a third, the VW Golf easily remained the most popular car model in Germany in 2010.